Legislator Anker and Chamber of Commerce encourage residents to shop local this holiday season. Miller Place, NY - November 20, 2014 - Suffolk County Legislator Sarah Anker is partnering with the North Brookhaven Chamber of Commerce to encourage residents to shop local this holiday season. Throughout the month of November, residents who shop at local businesses will be eligible for prizes and much more. On November 29th, Small Business Saturday, the prize drawings will take place at noon at Echo Pharmacy in Miller Place. To enter into the prize drawing, visit a participating local business and leave your name, address, phone, and email contact before November 29th. For a full list of participating businesses click here. 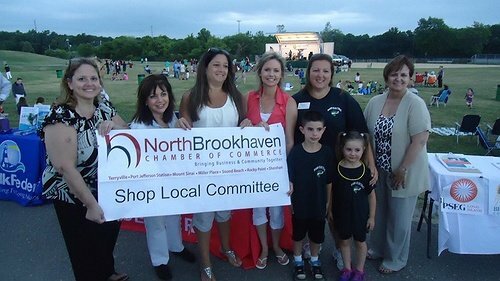 Pictured Above: Legislator Anker (Third from Right) is pictured with the North Brookhaven Chamber of Commerce’s Shop Local Committee at the 2014 Summer Concert Series. Subject: LongIsland.com - Your Name sent you Article details of "Legislator Anker and Chamber of Commerce Ask Residents To Put Your Money Where Your House Is"